This article first appeared in The Edge Malaysia Weekly, on February 12, 2018 - February 18, 2018. 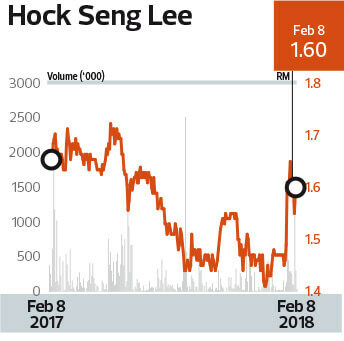 AFTER a stop-start 2017, which saw its two key projects delayed — leading to a margin squeeze — Sarawak-based marine and civil engineering group Hock Seng Lee Bhd (HSL) is now stepping up the pace in executing its mega contracts as it seeks to recover lost ground and drive an earnings recovery this year. The second and third quarters of the financial year ended Dec 31, 2017 (FY2017), saw its net profit margins drop to around 9% amid delays in Phase 2 of its Kuching centralised wastewater management system project as well as Package 7 of the Pan Borneo Highway project. For the former, contractual negotiations took some time and led to the contract only being signed in 3QFY2017, HSL says via email, and works began in 4QFY2017. The Pan Borneo Highway package also took longer than expected to take off due to manpower and machinery deployment challenges, among others. HSL says the issues are now being addressed and work will pick up going forward. “We are putting all our efforts into execution, which is already apparent in the uptick in revenue over the last reported quarter,” HSL managing director Datuk Paul Yu Chee Hoe tells The Edge. The company says its Pan Borneo Highway package is closer to 20% completion while the Phase 2 Kuching wastewater management system project is only at 2% so far. Another mega project, a contract to build a wastewater treatment plant plus sewer networks in Miri, is on schedule at 6% completion. HSL adds that the progress claims for these contracts are not yet commensurate with the respective completion levels so far. The Pan Borneo Highway Package 7 contract is the largest, worth RM1.7 billion with a 51-month completion timeframe since it was awarded in March 2016. HSL has 70% interest in the consortium undertaking the package. The Kuching wastewater management system contract is worth RM750 million with targeted commissioning by 2022. The Miri mega project is worth RM333.07 million. These form the bulk of its current order book of RM3 billion, of which 90% is outstanding, according to HSL. The rest is spread out over 15 contracts, it says. Last year, it added RM575 million to its order book via contract wins. HSL says it continues to bid selectively for works that match its strength in water-related engineering. One particularly interesting prospect may be the Sarawak water grid project, which the state announced last month. The 10-year endeavour seeks to supply treated water to residents of the interior across Sarawak. The first phase, estimated to cost RM1 billion, is slated for completion over the next two years. The state had previously estimated that 39% of rural residents do not have clean water supply. When asked, HSL confirms that it is hoping to participate. “Anything water-related would draw on HSL’s marine engineering expertise, so we would certainly be interested in participating in this project,” says Yu, adding that HSL had been involved in various water supply projects across the state. The consensus view among analysts is that HSL will finish FY2017 lower on both revenue and net profit, according to Bloomberg data. The mean estimate among six research houses pegs its FY2017 revenue at RM456.2 million, 8.49% lower year on year, and net profit at RM46 million, down 18.58% y-o-y. However, analysts also expect FY2018 to see an earnings rebound, based on Bloomberg data. The company is expected to record RM661.4 million in revenue and a RM71.7 million net profit this year, according to the mean estimate from seven research houses. If HSL hits those earnings estimates for FY2018, it would mark its highest revenue since listing in 1996. It has not recorded net profit above RM70 million since FY2015. HSL declined to provide an earnings guidance but says the market consensus view on FY2018 is reasonable. “What can be said is that we expect FY2018 to be better across all financial measures than FY2017. Margins will recover back to double digits,” says Yu. Last Thursday, HSL closed at RM1.60 per share, down 3.29% over the past year, with a market capitalisation of RM879.23 million. Last year, the stock fell as much as 19.3% between May and December, but it surged 13.79% in the second half of January this year to hit RM1.65 per share on Jan 29 — a seven-month high. While it does not have a fixed dividend policy, HSL’s payout ratio is typically around 30%. “We are always looking to reward our loyal stakeholders and ensure that they share in our success,” adds Yu. But whether the expected top-line increase will lift its bottom line too remains a question for market observers. For perspective, HSL’s net profit has been on a downward trend for five consecutive years since FY2012, amid fluctuating revenue, and FY2017 may extend that streak to six. When asked about it, Yu points to HSL’s track record of reporting profitability every quarter since listing in 1996. The company adds that upfront costs of some mega projects had added to the downward trend recently, but says a recovery has begun as the projects pick up pace.